Today we’re going to be exploring a very important part of the eCommerce customer service mix – the delivery. It’s essential to get your delivery strategy right if you want to get the order in the first place (returns and delivery pricing and speed remain the top reasons customers abandon that order), AND to get the repeat order by giving a great experience. It’s also a profitability battle ground, with customer expectations of faster speed and lower cost only going higher. 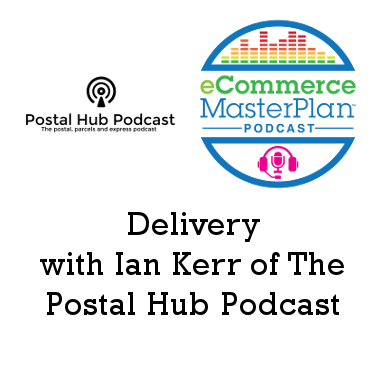 Joining me to discuss the topic of delivery is Ian Kerr, host of The Postal Hub Podcast, and all round global delivery expert. Ian’s family ran a post office in Australia, and as soon as he was old enough, he was also involved in the postal business. When he was of employable age, he began working on the counter and serving customers. He had a short spell in computing before returning to the postal world to work for the Post Office Agents Association, and from there he’s only gotten more and more involved with postal and delivery sectors. Now Ian hosts the Postal Hub, a weekly podcast where he speaks to postal delivery leaders from all over the world. The ‘keeping up with the Joneses’ effect in trying to live up to Amazon’s delivery methods is a common issue for a lot of eCommerce retailers. Can a small eCommerce business find a delivery partner who is going to offer the kind of services that Amazon can offer? Probably not. If you can’t offer those same-day services like Amazon, you should look for the next best thing. There are many startups in delivery that are trying to offer services for not just the big players, but the small eCommerce retailers and even bricks and mortar retailers who are looking to add same-day or guaranteed-time delivery. The real question, though, is how do you get your goods to your customer in the way that the customer really wants it? Customers are becoming more educated when it comes to their delivery options, and they have an understanding of what the options should be. You need to know your customer and understand what your customer wants. If you can find the right delivery partner, then you can offer many, though perhaps not all, of the services that a company like Amazon could. One easy way to be exposed to new couriers who may have what you are looking for is to listen to the Postal Hub Podcast. There is also a growing industry of delivery consultants who will help you not only to find the right services, but also help you broker the best deal in pricing. They understand the different products and price points that the carriers have, and they understand how to structure a deal. Another option is to outsource your picking, packing, and dispatching to a central point. This allows you to bundle your parcels in with everybody else’s, which often opens up a wider range of courier options. A trend in the postal and parcel sector at the moment is eCommerce fulfillment centers being set up by the carriers. From a carrier’s perspective, they’ve been only making money out of parcel delivery, but eCommerce is more than just parcel delivery. There are different stages to eCommerce, and now that they are aware of that, they are trying to offer services for every part of the chain. Listen to learn some of the postal companies who are getting involved in eCommerce fulfillment centers, and how that might get you preferential rates on shipping. You can think of Pick Up Drop Off, or PUDO, as just like the post office. The post office is the original PUDO network. It’s a place where people can pick up their parcels instead of having them delivered to their doorstep, and a place where people can drop off their parcels. Listen to learn what every eCommerce retailer needs to be aware of for successful first-time delivery, why they need to consider network density, and why the drop off part is especially good for fashion retailers with high rates of returns. Also called in-transit or interactive delivery management, in-flight refers to the idea that customers can redirect their parcel before it’s delivered, and in some cases, even after a failed delivery attempt. Customers can set up alternative delivery times if they won’t be home to receive their parcel, or alternative delivery points such as a neighbor or a PUDO point. The goal is to give the customer more control, however, in-flight changes also introduce a whole load of complexity into the last mile. The old milk run style of delivery — that is, the local postman starts at the post office, does the delivery route in sequential order, then returns to the post office — is the easiest and more efficient method of parcel delivery. As soon as you start messing with that sequential delivery route, you’re going to have drivers driving back and forth, juggling parcels, and trying to figure out who is going to deliver when. There’s a lot of technology behind it, but also a lot of inefficiency. That increases the price, so in-flight changes are typically a more expensive delivery option. Listen to learn how tracking has been great for the sector, and how much information is too much when it comes to tracking updates. Ian believes that a lot of the cool things in delivery are already happening, and that some of the things that people think are cool are actually not very cool. He is skeptical of drone delivery. It’s not as environmentally friendly as people originally thought it would be, in places with high gun ownership drones will be shot out of the sky, and there are a lot of privacy issues involved as well. Do you really want a drone flying over your backyard, possibly taking pictures, while your kids are playing around the pool? Things like proper autonomous vehicles could be cool because of things like self-driving parcel lockers that could be on the go. In Germany, one company is trialing a little robot that follows the postman around holding the letters and parcels. A lot of the cool things aren’t so visible, though, such as delivery route optimization and technology around predicting delivery, and from an eCommerce retailer’s perspective, those are going to be the more concrete, tangible things when it comes to improving the delivery experience. It is crucial to make your delivery options transparent and easily understood early in the purchase process. An eCommerce customer needs to know when the parcel is going to be delivered and how much it’s going to cost as early as possible in the purchase process, and it infuriates Ian that he doesn’t get that information until the check out. That’s just not good enough. You must give that information up front. Doing so creates a transparency, loyalty, and trust. It’s crucial not to give customers any surprises at the end, as well. Listen to learn about examples of unpleasant surprises in rural surcharges and cross-border transactions.